Feedback is an important component of the formative assessment process. The power of feedback lies in giving students the information they need to learn and improve. At the same time, if the feedback is clear and the next steps are doable, the feedback also gives students the confidence and motivation to move forward in their learning. However, research on feedback uncovers its Jekyll-and-Hyde character. Not all studies about feedback show positive effects. Two other things must happen in order for even well-crafted feedback to be effective. First, the feedback event must be an episode of learning for both teachers and students. Second, students must have an immediate opportunity to use the feedback. 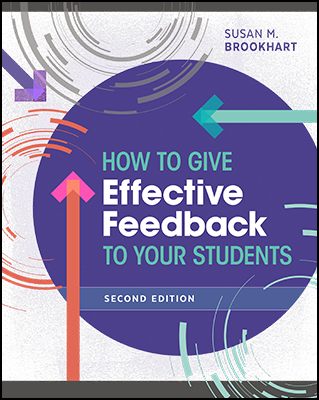 This webinar, presented by Susan Brookhart and based on her book How to Give Effective Feedback to Your Students, Second Edition, will explore characteristics of effective feedback messages delivered in the context of the formative learning cycle with those two other circumstances. Brookhart will use the metaphor of "three lenses" to do this: a microscope lens (looking at the feedback message up close), a camera lens (looking at a feedback episode as a snapshot of learning), and a telescope lens (looking for further learning).